In Sales 101, we learned that selling to SMBs vastly differs from enterprise sales. SMBs aren’t just scaled-down versions of their enterprise counterparts, in the same way, that large companies aren’t simply full-blown versions of small businesses. These are two very different creatures, each with its own unique characteristics, separate needs, and (consequently) distinct sales philosophies. In today’s infographic (and in the rest of this blog post), we’ll compare selling to SMBs vs. selling to enterprise customers and find out how the two approaches contrast with each other in terms of pain points, business objectives, buying process, decision makers, messaging, and ideal tactics. So, for the purposes of this blog entry and infographic, we’ll consider any business that falls outside the above ranges as an enterprise. 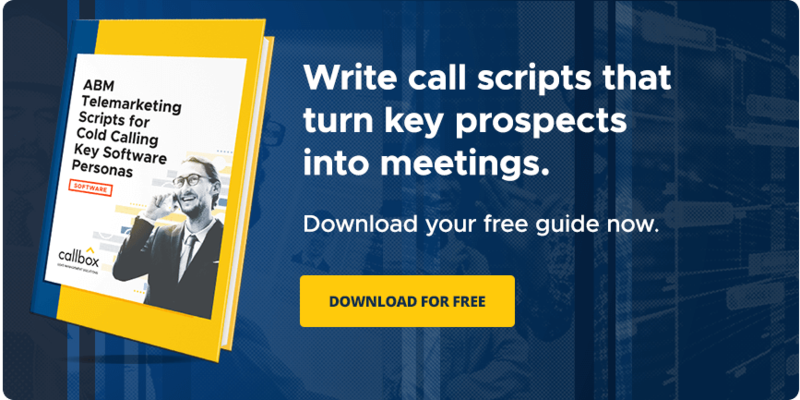 Get your FREE ABM Telemarketing Scripts for Cold-calling Key Prospects. SMB and enterprise customers face vastly different business challenges. For example, a survey of 1,000 U.S. and European SMBs reveals that two of the biggest pain points they experience are growing toward stability/profitability (47%) and increasing productivity through workflow improvement (47%). Meanwhile, for large enterprises, common pain points tend to revolve around specific business areas such as prolonged sales cycles, unintegrated distribution channels, poor return on IT investments, shrinking margins, inadequate reporting, and accountability, etc. Business priorities hugely vary between SMBs and enterprise companies. SMBs tend to focus on near-term results since they’re usually looking at shorter time horizons. That’s why, in addition to ROI, SMBs also consider a project’s or solution’s time-to-value (TTV), which is the time elapsed between decision to deployment. Enterprise customers, on the other hand, typically have the time and resources needed to carry out longer-term initiatives that impact their strategic position (market share, recurrent revenue, etc.). They evaluate how your solution’s benefits support this overall direction. Here is a 5-step approach that is guaranteed to give you enterprise leads and customers. SMBs arrive at a buying decision much quicker and more directly than their enterprise counterparts. While it can vary widely from one industry to another, SMBs typically complete a purchase within 2 to 90 days from initial contact. By comparison, enterprise companies follow a longer and less linear path to purchase, with well-defined steps and identifiable buying stages, which can span anywhere between a couple of months to several years. In small businesses, purchase decisions are often made by only one person. In fact, CEOs make 98% of all tech buying decisions in SMBs, although some key steps in the buying process are delegated to others in the company. In contrast, it takes an average of 6.8 stakeholders to arrive at a buying consensus in enterprise companies. Each stakeholder represents a specific business area or department with his/her own interest and expertise in the solution being evaluated. When evaluating a purchase, SMBs do their research in a way that’s similar to consumers. For example, at least half of SMB buyers choose top brands and the vast majority of SMB decision makers rely on Internet searches and review/recommendation websites. SMBs also want vendors to clearly explain how their solutions translate into business value. Enterprise customers use multiple pieces of in-depth content during the purchase process. Around half of enterprise decision makers involved in the buying cycle consult between 2 to 5 content materials, including whitepapers, case studies, webinars, blog articles, etc., to evaluate a solution. Tactics which are effective at reaching out and engaging SMB customers include a combination of inbound and outbound channels. Paid and organic search closely match how SMB decision makers seek information and thus are effective channels, especially when combined with the scale of email marketing and the personalization offered by targeted one-on-one calls. Similar inbound and outbound channels apply when selling to enterprise customers. But the tactics need to lean toward nurturing enterprise sales opportunities through multiple touches with a rich content portfolio. There’s more to the SMB vs. enterprise comparison than just sheer size alone. That’s why selling to either segment isn’t as simple as scaling down or scaling up your sales strategy. Both require a hugely different approach. Speaking of sales approach, Callbox’s flexible multi-touch, multi-channel marketing strategy helps businesses reach and engage their target buyers (SMB or enterprise customers) in key B2B industries. Learn how you can leverage our award-winning marketing solutions for improved sales performance.